Patra's Other Place: The joys of retirement, NOT! Poor Ken doesn't know what's hit him. He assumed his non working life would include lots of sleeping in on cold mornings, snoozing on the couch after messing around with the t.v. and checking on the birds in the aviaries now and then. I got news for you, buddy. There Are Things To Be Done! The new roof was not actually planned - it came to happen because of the worsening leaks in heavy rainstorms. We were planning to have the house painted this winter, but for obvious reasons it would have been stupid to paint the walls and ceiling with new water stains appearing after every storm. The other things that have been happening are on a To Do list that I created for Ken when he quit work. Not necessarily things that I want him to do, but stuff that he has been wanting to do but never had the time while he was working. One such thing was getting the hailstone damage on his car fixed. It has been there for about three years, and was very irritating for him every time he looked at the dents. So he finally got a quote to have it done, and the guy turned up today with his van of tools and paints, and did a great job on Ken's car. (It ought to be good, for $500). Anyway, Ken is happy about that. But while that was being done, tradesmen were traipsing in and out of the house, working on not only the roof, but bathroom renovations. Not major work at this stage, but jobs that are taking a few days. Electricians and plumbers, all of whom Ken had to speak to about what was to be done. I got out of the mayhem just before lunch, and returned home a couple of hours later, having spent much longer at the shops than I needed to! Ken was just about pulling his hair out - the phone hadn't stopped, people were coming and going..."I wish I was back at work!" he wailed, and I grinned and said "Well, now you know what it has been like for me all these years while you were at work, and I was the one dealing with the tradesmen!" One of our bedroom windows had a crack in it, after birds had been flying into their reflections for years. So I called the insurance company, and they arranged for a bloke to come and replace the window. That was done yesterday, but it still has to have solar tint film applied to the inside like the original window did. We thought that would all be done at the same time, but no - a different company will come next week sometime to do the tint. The most annoying thing about all this is that tradesmen don't always come when you are expecting them; they tell you they will be back the next day to finish the job but don't turn up - and don't ring up to let you know. I'm used to this; I've been dealing with tradies for years. But not Ken! He was very cross when the electricians didn't turn up last Friday as they promised, nor did they come yesterday (Monday). Nor did they phone....When I got home this afternoon Ken was ready to tie down! He said "I just phoned that bloody electrician to ask what the hell was going on. He said they were on the way here now. Then he called back to say he was delayed and wouldn't be coming until tomorrow, so I gave him a serve and he changed his mind". The sparky did arrive, and did some of the work, but it is still not finished, and won't be until next week. 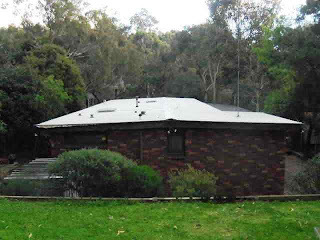 Same with the roof. 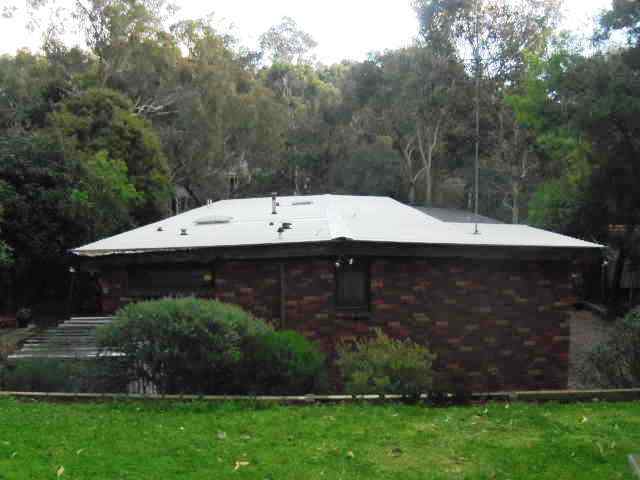 It is all on and water proof, but the oregon fascia at each end of the house has to be covered (it was originally going to be replaced but the roofing company suggested it would be a lot cheaper and just as effective to cover it with Colorbond like the roof). We thought that was a good idea, and the steel was delivered this morning. Guess what. Wrong size. More delays. In the meantime, the house is getting dustier and dustier, and there is a large hole in the ceiling of each bathroom where the plaster has been cut away ready for the new lighting/heater combination. I said to Ken tonight "Can you tape some paper over those holes so no creepy crawlies come visiting during the night?" and he said no, it's not necessary. It's a brand new roof with new insulation - spiders haven't had time to make new homes in there. Wanna bet??? 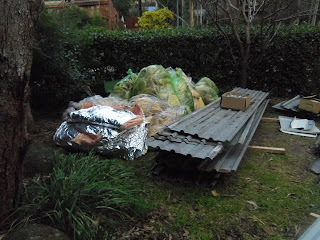 All that stuff in plastic is insulation. The pink and foil is what's left over of the new stuff. I was wondering if it would be suitable to use for wadding (minus the foil) in quilts, but decided not to try that. The colour of our new roof is called "Surf Mist". Ken wanted green to match the environment (trees) but was persuaded that the white roof would be more effective deflecting the sun in summer. Tradesmen are the same way here - they give a four-hour window of time, and sometimes don't call until the last minute of that four hours to say they can't make it until the next day. Poor Ken. Your house looks lovely (photo of the roof). My SewEzi table will be here tomorrow!